Scholars, intellectuals, policy makers, and academics from various field related to defence and security participated in the round table. 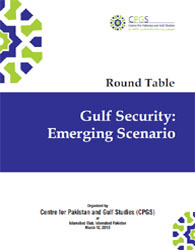 This round table was aimed at discussing the evolving geopolitical and geostrategic situation of the gulf religion, security challenges, emerging security landscape of the region and future policy options for the countries concerned. The roundtable was chaired by the CPGS President, Senator Sehar Kamran and moderated by Syed Muhammad Ali, member Board of Directors, CPGS. The roundtable started with the brief introduction of the panelist to the participants. Prof. Marvin G. Weinbaum presented his views on the evolving situation of the Gulf Security and what, in his point of view; the security landscape of the Gulf Region will look like in future. After his impressive and knowledgeable talk on the issue, the house was opened for the questions and discourse. The scholars from the strategic community of Pakistan and Gulf Region held deep discussion with the panellist through questions and debate.